Now that Atlantis has finally risen to take its place on the world stage, the Atlantean warriors are having to face some new and interesting dangers — like Halloween parties. Arrogant warrior Liam doesn’t understand the beautiful, bubbly human whose entire function in life appears to be to plan parties, but he can’t seem to keep away from her, either. Jamie, who considers herself to be completely unflappable–the hallmark of a great event planner–doesn’t understand why the far-too-serious Atlantean manages to get under her skin with every single encounter. Even if he is the sexiest man she has ever seen. 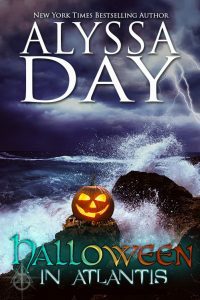 When the two of them are thrown together to solve a mystery surrounding the queen’s missing jewels, sparks fly, secrets are revealed, and Halloween has never been hotter. This novelette (longer than a short story, shorter than a novella; 53 pages & a little more than 16,000 words) is perfect for reading on a coffee break – or in between handing out candy to trick-or treaters. *NOTE: You can buy the print version as part of the companion Christmas in Atlantis 2-story paperback book using the link at the right.